Tuesday December 22nd 1896 The boys both went to the valley. I was at home all day, worked on carpet and did other work. weather pleasant. Wednesday December 23rd 1896 Got the morning work done and we went out to Horns by invitation, had a pleasant visit. I read in the evening. Thursday December 24th 1896 Was busy with the baking all forenoon. We went to town after dinner and was over home awhile. Got my new rag carpet. Friday December 25th 1896 A pleasant Christmas day. We went over home early We got some nice presents thought we did not give any. Mother had a good diner. we spent a pleasant day. Saturday December 26th 1896 Will bought a young cow of Mrs Kirkwood this morning. He went to town in the afternoon. I sewed on carpet. Sunday December 27th 1896 We got up so late we could not go to church. Went down to Stevens just before noon, found other company there. We spent a very pleasant day. 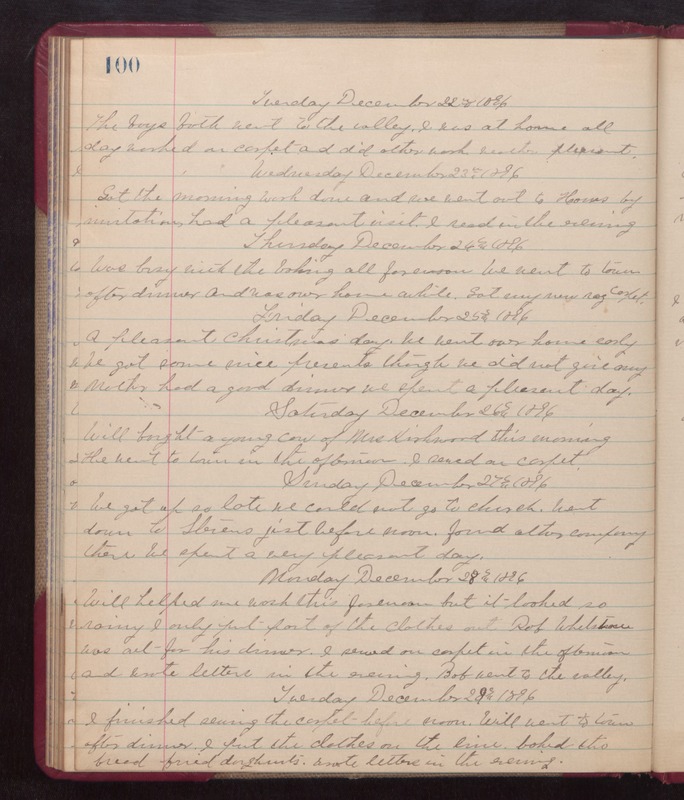 Monday December 28th 1896 Will helped me wash this forenoon but it looked so rainy I only put part of the clothes out. Rob Whetstone was out for his dinner. I sewed on carped in the afternoon and wrote letters in the evening. Bob went to the valley. Tuesday December 29th 1896 I finished sewing the carpet before noon. Will went to town after dinner. I put the clothes on the line, baked the bread, fried doughnuts, wrote letters in the evening.